Harvey has put together an eclectic mix of 20th-century piano music all requiring a wide array of technical accomplishment and musical subtlety. As all of these pieces were recorded over a large span of time—the earliest in 1998, the latest in 2010—it is difficult to discern whether they were envisioned as a coherent recital or not. Regardless of that, all of them cater to Harvey’s strengths. Kevin Puts’s Alternating Current is a three-movement work. The first resembles a 20th-century take on a Baroque composition, the second is described by its composer as “a slow dance” with a “sense of quiet nobility,” while the third is a whirling toccata à la Prokofiev. Ross Edwards’s Etymalong , from his Sacred series, is a piece built on the use of quasi-Minimalist repetitious material, though inhabiting a sound world similar to the piano works of Toru Takemitsu. The Polish composer Gra?yna Bacewicz’s Second Piano Sonata, like Kevin Puts’s aforementioned composition, is also composed of three movements in the traditional sonata order of fast, slow, fast. It is at times dissonant, at times sparse. It recalls the percussiveness of some of Bartók’s music while maintaining the rich harmonic language of its age. Carl Vine, perhaps better known to pianists by his sonatas, is here represented by his Five Bagatelles. They are quirky little pieces all with their own individual moods, being just long enough to make one wish that there were a few more of them. The program ends with the biggest work, Dutillieux’s Piano Sonata. It is one of the cornerstones of the 20th-century repertoire and it is the first work of the composer’s that he thought important enough to be considered his opus 1. Its opening is reminiscent of Ravel—think a midcentury version of the Sonatine. It has a particularly French quality throughout, though by its final movement—a theme and variations—one can hear the sound of the Dutillieux that was yet to come. Throughout this recording, Harvey shows off her ability to master the many techniques necessary to play this music, quickly moving beyond them in order to bring out the subtleties of the music. Recently Robert Levin has also released a very fine recording of the Dutilleux on ECM, which I personally would not want to be without. Whether one has recordings of all these pieces, however—and one probably does not—run out and get this! It makes for some very enjoyable listening. This collection of piano works has, as its title track, the work by youngest composer on the CD. This is refreshing to see in and of itself, but it's also a good description of the way the recording shifts stylistically between poles (albeit poles that are not very far apart) of neo-tonal lyricism and harsh, dissonant modernist textures (though never crossing into the purely experimental or total control of the integrated serialism). The eclectic nature of these works shows a keen programming mind at work here. Each work is contextualised by the works on either side of it, and this kind of background thought promises a thoughtful recording event. Indeed this is the case, from the order of tracks to the miking technique, this recording displays musical thought and achieves great sonic impact. The sound of these recordings is exciting and, at times, overwhelming. But this is also due to the fiery virtuosity of Bernadette Harvey's playing. This is a pianist worth treasuring. Not only is she willing 10 play modern repertoire (and for this composer, that's almost enough of a reason!) but she attacks each work with an enthusiasm reinforced with superb technique and deep musicianship. 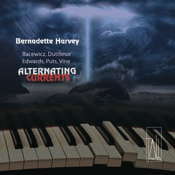 Puts's Alternating Currents is the most tonal work on the recording. At times, it has much in common with American film and television scores from the late 1990's onwards. This always leaves this reviewer feeling that something is missing from the music - visual images primarily. Yet the saving grace of this piece is the breadth of harmonic and rhythmic language in the opening and closing movements, which frame and give context to the lyrical sections. Ross Edwards's Etymalong is the first alternating current of the CD. After so much space is taken up with the rhythmic drive of Alternating Currents, this work concentrates more, it seems, on the interactions of the resonances within the piano. This is a piece that needs to be heard without distraction. It is a chance for the listener to concentrate deeply on the most subtle nuances and shifts of harmonic colour. It is beautifully recorded. Vine's Five Bagatelles display both the composer's deep knowledge of the piano and its technical capabilities, and the technical and expressive range of Harvey's playing. This piece has rarely received such a fine advocacy in either the concert hall or in recording. Once again, the technical brilliance of the pianist is matched by the superb sonic world created by the recording. The final work, Dutilleax's Piano Sonata is probably the most 'modernist' in the collection, and is a powerhouse piece for a formidable pianist: Harvey is more than up to the challenge. Her technique is beyond question, and this is, without a doubt. the best recording of this piece I've heard. I recommend this most highly to any serious pianist or student of piano literature. It's a wild and fun ride of a sound world that isn't as fully explored as many would like to think.